Easy Elegant Flower To Knit (Not Crochet!) - Free Knitting Pattern! 1) MUST be easy enough to knit up quickly. 3) Must look beautiful and not a child's craft project. I found out that there are a lot of patterns for crocheting, and even some knitting patterns that say they are knitting patterns but then when you read how to do the flower applique it switches to hooks and chains. This to me was frustrating, since I do not crochet and I refused to think that 2 needles had more limits than 1 hook. I found one pattern that I liked and so I have modified it slightly to have 8 petals and look fuller to share with the world. This pattern is very very easy! - Flower is approximately 3 inches in diameter. 1) Cast on 56 sts. 3) *K1, BO 5 sts leaving last st on right needle. Repeat * to end. (16 sts). 4) Cut yarn leaving an 8 inch tail. 5) With yarn needle thread tail through all remaining sts and pull tightly. Securely tie off and cut any ends. 6) To get it to lay flat I push all the petals through the holes so that they are all facing the same direction. I have also designed a beautiful flower and leaf pattern to knit (I repeat knit, not crochet!) shown below in Cranberry Red yarn. Wonderful for embellishing sweaters and scarves (and oh so cute on baby hats) where it won't flop over on you. It is approx. 4 inches in diameter. If you would like the flower and leaf pattern directly e-mailed to you asap (in pdf format), just click on the button below the pictures. Here is the button link. All you need is a paypal account, no sign ups or other stuff! Happy Knitting! I call this one my Bella Flower. For Knitters who can handle 2 needles but not 1 hook! Here is my second flower that I have come up with for all the knitters of the world! It's amazing how many flowers you can crochet, but there are not too many for knitting. Maybe it's just my stubborness on learning how to crochet that forced me to come up with some nice flower patterns to knit with 2 needles! Great as an applique, embellishment, or accent for scarves, hats, sweaters, and things crafty and beautiful! - Step-By-Step Instructions with color photos to help you along the way. - Flower size is approximately 4 inches in diameter. - Pattern includes flower and leaf pattern! - Flower is knit in one whole piece! Seamless. - Gauge is not important. You can get this flower and leaf pattern directly e-mailed to you asap by clicking on the button below. All you need is a paypal account. No need for anything else! Enjoy! Ever try to find a flower knitting pattern (I repeat, KNITTING, not crocheting!) that is easy, beautiful, and doesn't look like a kid's craft project? Well here is my answer! This beautiful easy flower knitting pattern is for all you knitters out there searching for the perfect, quick, simple flower for all your embellishments. - Knitting Pattern in PDF Format – 3 pages including title page. - Pattern includes flower and leaf shown in photos. - Step-By-Step Instructions with color photos. - Skill level: Beginner, super easy. - Flower is approx. 3 inches in diameter. - Leaf is approx. 2 inches in diameter. Just click on the button below to get the pattern e-mailed to you directly. All you need is a paypal account, nothing else! Let your imagination fly! 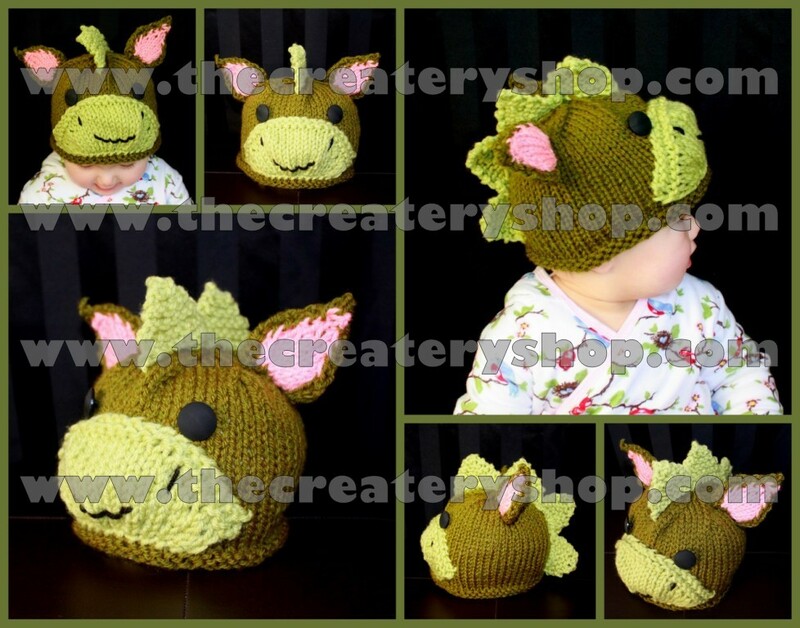 My little girl just loves dragons, and I knew a dragon hat would be just the thing she needed to not only keep her head warm but let her imagination soar! What animal are you? Well, more specifically, what kind of animal hat are you? As my journey of knitting hats continues I have noticed my 3-year old really taking to each of them and creating stories and games out of the hats. You can't get much more creative than a 3-year old's mind at work! So I thought I would put the next few hats out to you all. Tell me what kind of animal (real or make believe) intrigues you or your child. I will try to make it and am up for the challenge! I found this color of yarn that is, how can I describe it, lion-y? Somewhere between buttercup, light mustard, and beige lies this “lion” of a color! Anyways, all I can say is that it is made by Georga yarns and it is absolutely delicious! 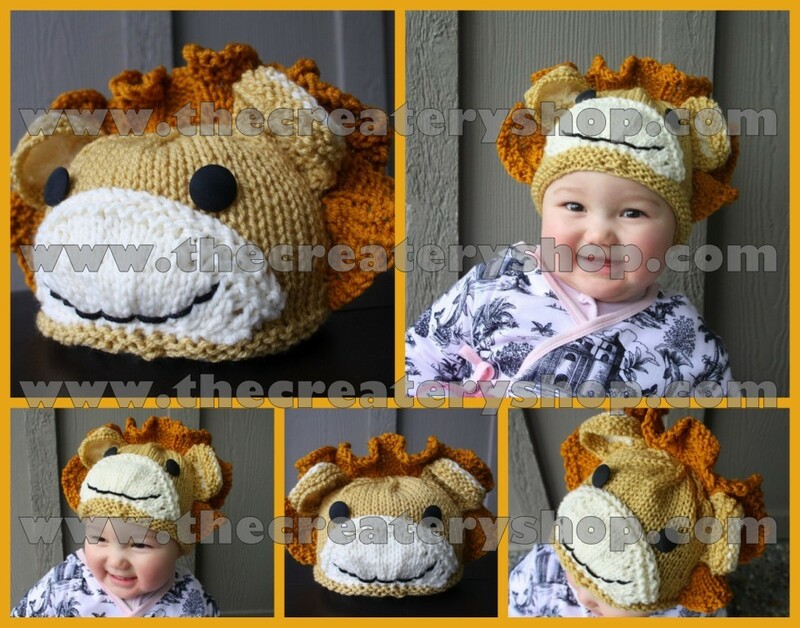 Of course it reminded me of a lion and of course I had to knit a cute baby hat from it…and voila! Anyways, I am digressing. Back to the hat, very simple yet familiar. So for today, may I suggest you think about that teddy bear you once had for a moment? Even though it may have been many years ago, I think you will find that it just made you smile again. People just love sock monkeys! They come in a variety of shapes, colors and forms, yet all have a very distinguishable face that is easily recognizable. The timeless sock monkey is of course no longer just made out of socks! 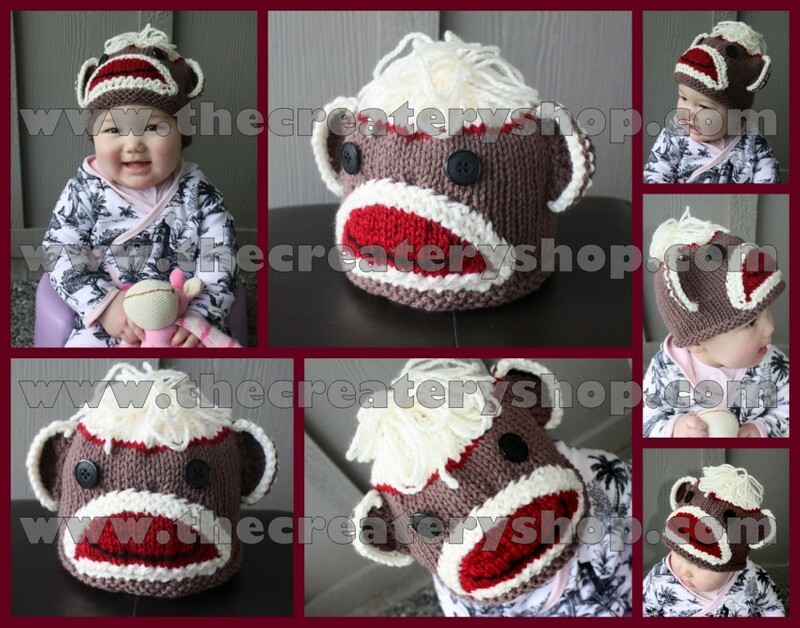 This is my version of the lovable monkey as a knitted hat. Knitting Pattern in PDF Format – 4 pages including title page. Size: (0-6months, 6months to 1.5yrs, 1.5yrs+, Adult). Please note baby head sizes vary so much! These sizes are approximate. This is a knitting pattern in PDF document format. The pattern will be e-mailed to you within 24 hours of receiving payment. So please ensure that you provide your correct e-mail address. Please contact The Createry Shop if there are any questions or help needed with the pattern. Also, don't feel like knitting? We can make it for you! If you would like us to make the item and ship it to you, just contact us for more information. The Createry Shop patterns are protected by copyright. You may not rewrite, redistribute, or resell the patterns in any form. Patterns are for personal use only and is not for mass production. 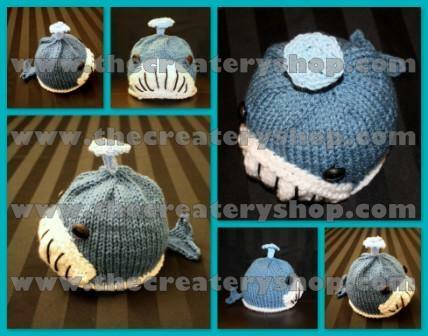 You may not sell the items made from the patterns without written permission from The Createry Shop. 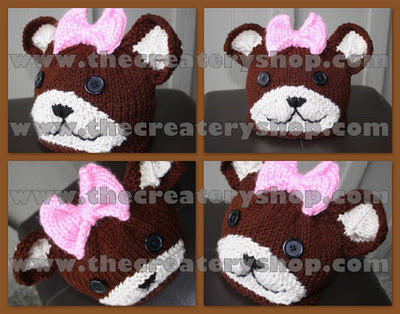 For more wonderful projects, visit http://www.thecreateryshop.com/! 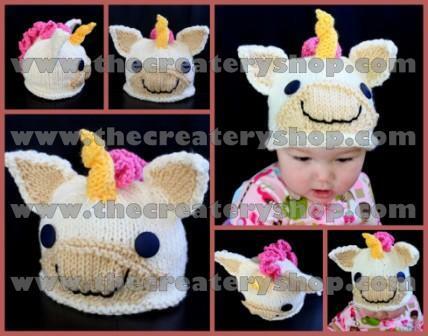 This cute bunny hat is knitted in one piece and is such a treat for any baby or kid who enjoys wearing pointy ears! Great for springtime this hat is sure to catch some attention. 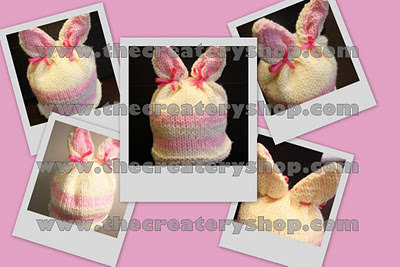 I call it the “Knotty” Bunny Hat because you tie two knots with either yarn or decorative ribbon to complete the ears. Knitting Pattern (PDF) - 3 pages including title page. Step-by-step instructions with color photos. Sized for (0-6months, 6-12months, 1-3yrs, 3yrs+). This is a knitting pattern in PDF document format. The pattern will be e-mailed to you within 24 hours of receiving payment. So please ensure that you provide your correct e-mail address to me.